The BOSS MT-2W Metal Zone Waza Craft Guitar Effects Pedal has been a go-to for guitarists for over 25 years, becoming one of the most popular pedals in the BOSS line-up. Known for its impressive tonal power and enviable versatility, the MT-2W takes on that pedigree and adds in the unique Waza Craft spirit. The Metal Zone has been a staple amongst many a guitarist's pedalboard since its introduction back in 1991. Thanks to its generous tone-sculpting options on offer, it isn't a one-trick pony. From fuzzy and saturated low-end riffing, scooped mids that are the stuff of a thrash metaller's dreams, to searing high end clarity for squealing harmonics, the MT-2 can do more than just sit in front of your amp and sound gnarly. Rather than re-inventing the MT-2, BOSS have simply made it better. The MT-2W is equipped with two modes to choose from: Standard and Custom. In Standard mode you'll get the legendary mid-driven MT-2 sound, which you'll find has been made highly responsive with enhanced definition and clarity. Every pick stroke, scrape, bend, sweep is delivered with aplomb, whilst the reduced noise of the circuit optimises performance at ultra-high gain settings. Flick the switch over to Custom mode and you'll find that soundscape pushed wider for increased dynamics and tempered lower mids for a tight response. Those palm-muted chugs and lightning fast rhythm licks across the lower strings stay focused and jump out in the mix. Slip back the volume level and the sound cleans up beautifully for awesome tonal control. Across the top panel of the MT-2W you'll find the classic control layout that we've all come to know and love from the MT-2. From left to right there's controls for Level, High and Low, Middle and Mid Frequency, and Distortion. The Level control is perfect for dialling in the pedals output level, giving you the option to make a discreet or huge impression when you hit the footswitch. High and Low controls allow you to boost/cut up to 15dB, whilst the Middle and Mid Freq controls allow you to scoop the mids or simply tweak to find a sweet spot. The Distortion control can take you anywhere from a subtle boost to an avalanche of raucous distortion. The enviable consistency of a BOSS pedal is an established fact, which is why they are favoured by so many from amateur to pro. The Waza Craft team adheres to that same superior level of durability, whilst integrating meticulously crafted analogue circuitry. 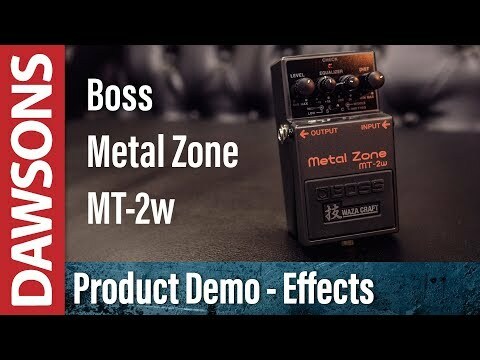 The MT-2W Metal Zone Waza Craft Guitar Effects Pedal is a superb example of BOSS at their finest.